Look out system administrators: Hewlett-Packard wants to give you more time to play video games or polish up your resumes – or both – with the forthcoming launch of its ProLiant Gen8 servers. .
As part of its annual shindig with partners and resellers, which was hosted in Las Vegas a week ago, the biggest server shipper in the world previewed its next generation of ProLiant x86 servers. The Gen8 machines will be based on the also impending "Sandy Bridge-EP" Xeon E5 processors from Intel, which are due for their own launch before March comes to an end. Because these Xeon E5 chips are not out yet, HP was limited in talking about the feeds and speeds of the Gen8 machines, and as El Reg previously reported, the company's top server brass talked generally about the improved I/O and storage scalability of the boxes and how this was critical in data centers where storage capacity needs are far outpacing the need for more CPU capacity. We glossed over the management capabilities HP talked about in our initial story, and now we will drill down into it. "This is about re-architecting the server so it is ready for the scale that the cloud needs," said Potter, saying that the current way of doing manual operations on servers was "unsustainable." He said that in a typical data center, weighing in at 10,000 ft2, manual operations cost an average of $24m over three years, and that running the facilities manually (rather than automatically) adds another $29m in higher energy costs over the same three years. He cited statistics that this class of data center typically has a downtime cost of around $10m an hour. With the system management tools that HP is rolling out with the ProLiant Gen8 boxes, the tools would give back another 30 days a year (that's six weeks if you work a five-day week) per system administrator and would also allow companies to double the capacity in their data centers because of easier and more automated management and more sophisticated power capping and load balancing across machines in the data center. The system software that HP has cooked up is agentless, and the system now boots up in under three seconds. The servers have over 1,600 parameters that are tracked inside the box through what HP calls Active Health, which not only allows for problems to be resolved around five times faster than with the predecessor ProLiant Gen7 machines, but also allows for Insight management tools to work with HP's support systems (now branded Insight Remote) to do proactive fixes before something goes wrong. So if a disk drive is getting wobbly, the system notifies HP, which ships a new drive. Simple stuff like that. 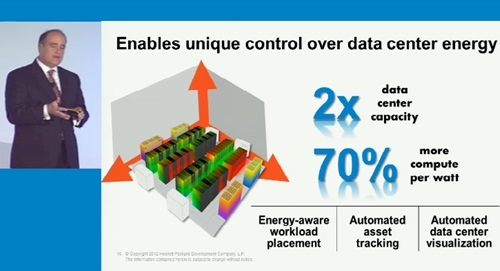 The ProLiant G6 servers from several years ago had a "sea of sensors" that were dedicated to monitoring power and cooling to try to optimize the servers for power efficiency. But with the Gen8 machines, the idea is to focus on the health of the system. "We have richer information, and we can get at it five times faster," John Gromala, director of marketing for the ISSS division at HP, tells El Reg. "And that information can flow back to HP to help the company to improve its support operations." In early tests, the new Insight Online and Insight Remote services working through all those new sensors helped system administrators attain a 95 per cent first-time fix rate on problems and fix problems 40 per cent faster, too. The new ProLiant Gen8 tools also include Smart Update, which allows the provisioning and updating of thousands of servers with the click of a mouse. On a single server, Smart Update runs on the Integrated Lights Out (iLO) service processor in the box, but if you are managing a large number of machines, you plunk it onto a Windows or Linux machine and it can then sequence updates across hundreds or thousands of machines, both for updating the firmware on the ProLiant machines and any drivers that are running to link peripherals to the server. "This is the single biggest thing that IT shops have to deal with," says Gromala. Potter, his boss, said that on a rack of 32 PowerEdge servers from Dell, it took 295 minutes to provision the machines, but with the Gen8 machines and Smart Update tools, 32 machines could be provisioned in 10 minutes. Presumably the ProLiant G6 and G7 machines were no more or less pokie than the PowerEdgies. Smart Update does not provision and patch hypervisors, operating systems, or application software. It does link into the new HP tech support portal, called Insight Online. HP is thinking more than across a bunch of servers in a rack, but across all the racks in the data center. In conjunction with the ProLiant Gen8 preview, HP trotted out Location Discovery Services and Thermal Discovery Services, two bits of software from HP's Technology Services unit, which worked in conjunction with the ProLiant server group to cook up these extensions to the Insight Control v7 management tools. These Insight tools are one of the reasons why HP needed to buy Compaq a decade ago. The ProLiant Gen8 machines will come with Platinum Plus-rated power supplies, which have a 94 per cent efficiency rating. But this is not enough to make the data center itself more power efficient. The location and thermal discovery services will allow a server to figure out where it is in the data center racks and rows, what power distribution units it is feeding off of, and what the thermal and power conditions are like around it. Then, having assessed its thermal and power environment, the server can use data from these tools to automatically configure its power capping settings so it doesn't cause an overheating situation. All of this data is automatically captured by the PDUs – yup, you need to buy HP PDUs – and sysadmins don't have to try to keep their server power cap and location data in a spreadsheet.